Book Note: How to Accept German Reparations. The review below will be published in Human Rights Quarterly, Vol. 37, February 2015. I have permission to post it on my blog and one reason I am doing so is because Slyomovics ends her book, as I end this review, by advocating reparations to Palestinians for land and property they have lost to the state of Israel. As I write this (July 22, 2014), Israel is again attacking Gaza. I have just signed an open letter from Canadian academics to our own government criticizing its one-sided support of Israel. I wish I had something new and worthwhile to contribute to the on-going debate about Israel/Palestine, but I don’t. I would love to see one federal state in which both parties could live in peace, side by side, but that isn’t going to happen, at least any time soon. 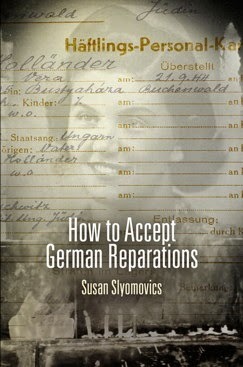 Susan Slyomovics, How to Accept German Reparations, (Philadelphia, University of Pennsylvania Press, 2014), ISBN 978-0-8122-4606-3, 373 pp. This is an extremely personal book. 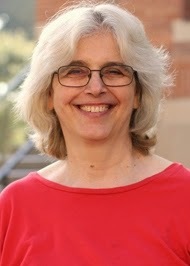 Susan Slyomovics, an anthropologist of the Middle East, reveals her own Jewish family’s reactions to German reparations in order to analyze the meaning of reparations in the overall context of mourning for the dead. Full disclosure requires me to say that I may have been more interested in this book than other potential readers because my Jewish family’s story intersected with Slyomovics’. Slyomovics’ father may well have met members of my extended family. He was able to come to Canada with his wife in 1948 because the government agreed to permit 500 furriers to immigrate, and he had trained as a furrier in Leipzig before the war. While in Leipzig, he might have met my great-uncle and my step-grandfather, both of whom were furriers. And he might have eaten in the last restaurant open to Jews, owned by a member of my extended family (later murdered). But one does not need to have such a personal reaction to profit from reading Slyomovics’ brilliant analysis of the meaning of reparations. This is a book informed by deep thought and theoretical speculation, especially on the meaning of money and its connection to emotional relationships. Slyomovics’ mother and grandmother survived the concentration camps, but they had very different attitudes to reparations. Her grandmother took everything she could get, while her mother refused “blood money” until the twenty-first century, when she decided to accept reparations for slave labor. But she made sure that as soon as reparations funds arrived in her bank account, the money went out again, donated to various Jewish causes. Her own contribution to post-Holocaust reparations consisted of witnessing, as a frequent speaker at Canadian high schools. In particular, she visited the high school in Eckville, Alberta where James Keegstra, a notorious Holocaust denier, had taught history, blaming every great European tragedy on the Jews. The German term for reparations to Jews and other victims of Nazism is Wiedergutmachung (making good again). A better term would be Wiedereinbischenbessermachung (“making things a bit better,” my own coinage in my high school German). Building on George Simmel’s analysis of money, Slyomovics argues that the “monetization of guilt” (p. 24) buys an element of social peace, in which money is exchanged for forgiveness. Referring to the German philosopher Axel Honneth, Slyomovics also argues that reparations function as a form of recognition, an awareness of the necessity for perpetrators to respond to the pain they caused and commit “acts of collective atonement” (p. 67) yet German reparations policy was fraught with emotional problems. In the early post-war period, many German officials took an adversarial approach to Jewish claimants for reparations. And for the claimants themselves, the necessity to tell their stories to German officials was often a form of re-traumatization. Reparations money was an inadequate substitute for all the other ways in which Jews created and enacted “rituals of remembrance” (p. 182). Since the fall of the Berlin Wall, many surviving Jews and their children and grandchildren have made pilgrimages to their places of origin. There, they have refurbished Jewish cemeteries and installed tombstones in memory of the dead, building “recreated cemeteries minus actual bodies” (p. 192). These rituals constitute what Slyomovics, following the literary critic Marianne Hirsch, calls “post-memory” for the children of survivors (p. 185). Archives are also an important aspect of coming to terms with the Holocaust, as children and grandchildren find small clues about their ancestors’ lives. The “archival sliver” (p. 118) provides a tiny window into the Holocaust as individuals Jews endured it. Slyomovics, originally a scholar of the Arab Middle East and an Arabic speaker, ends her book with two chapters on how reparations play out elsewhere. She first analyses Algerian Jewish claims for reparations from Germany. Algerian Jews were not deported and murdered, but they were interned, separately from interned Algerian Muslims. But the Algerian Jews did not view themselves first and foremost as Jews: they viewed themselves as French citizens who were eventually “repatriated” to France (a country they did not come from, being indigenous to the Middle East). And while they did eventually receive compensation for their internment, their Muslim (then)-compatriots did not, as Germany argued that the Muslims had not been interned on racial grounds. Discussion of Algeria leads Slyomovics to a wider analysis of settler colonialism, in which she asks “who counts as human?” (p. 235). She notes how careful Israel has been in the few contexts in which it has paid compensation to individual Palestinians to use the Hebrew word pitsuyyim, which means damages, instead of the word shilumin, meaning reparations (p. 254). She calls for “Jewish Israeli reparations to Palestinian Arabs, underpinned by the Palestinian right of return” (p. 269). I agree with her call for reparations, but I doubt very much that Palestinians will ever enjoy the right of return. This is precisely where the analogy between Jewish victims of the Holocaust and Palestinian victims of Zionism ends. Jewish victims of the Nazis (and their descendants) do not, for the most part, live in Europe; they successfully integrated into Israel, the United States, and elsewhere. Palestinians remain in Israel, in the Occupied Palestinian Territories, and in several Middle Eastern countries where they are permanent refugees. As long as they are not full citizens anywhere, reparations will never compensate for their loss of land. I have one quibble with Slyomovics’ analysis. She discusses the connection between German settler colonialism and the Holocaust, referring especially to the massacre of the Herero in South-West Africa (now Namibia) in 1904-07. Many scholars of genocide now refer to the Nazi occupation of Eastern Europe as a form of colonialism. But to subsume the Holocaust under the rubric of colonialism is to ignore the far more complex causes of Nazi policies toward Jews. Nazis exterminated Jews in their Eastern European colonies; they did not treat other ethno-religious groups in the same manner. One cannot ignore two millennia of anti-Semitism as a cause of this extermination, even if the Nazis racialized what had earlier been religious prejudice. Nor should one ignore the economic, cultural and political crises in Germany from 1918 to 1933. There was no straight line from colonialism to the Holocaust: had there been one, Germany’s enemy, Britain, would also have been in the business of slaughtering Jews. Otherwise, How to Accept German Reparations is a fascinating read, with insights on reparations, mourning and memory that far transcend the particular instance of the Holocaust. Anyone interested in these issues, no matter where they apply, should read this book.